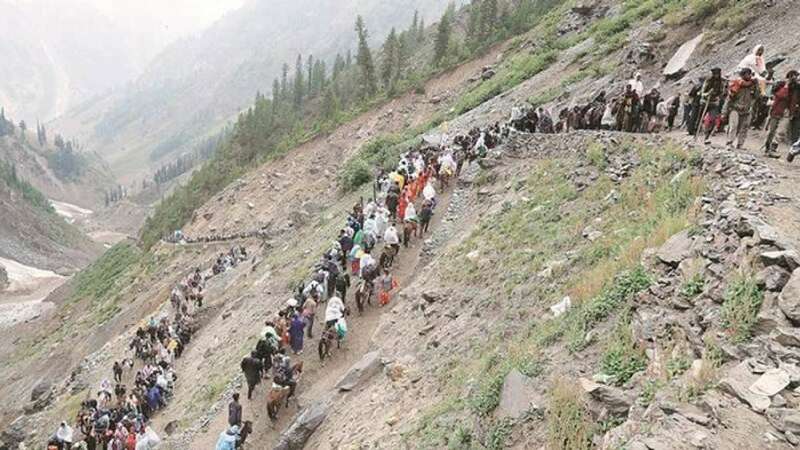 Jammu : A fresh batch of 4,477 pilgrims on Saturday left winter capital Jammu to perform the Amarnath Yatra after the Jammu-Srinagar National Highway was restored for traffic. "Comprising 3,298 males, 986 females and 193 sadhus, the yatris left the Bhagwati Nagar Yatri Niwas in 136 vehicles escorted by the security forces", officials said. The convoy of vehicles carrying the pilgrims left Jammu at 4.15 a.m. as no vehicle carrying the yatris is being allowed to cross the Jawahar Tunnel on the Jammu-Srinagar highway after 3.30 p.m. due to security reasons. No pilgrim was allowed to move to the Valley yesterday due to blockade of Jammu-Srinagar highway due to landslides in Ramban district. The 40-day yatra started on June 29 and will end on August 7 on Shravan Purnima coinciding with Raksha Bandhan festival. So far, over 10,000 pilgrims have had Darshan inside the Cave Shrine situated in Kashmir Himalayas at an altitude of nearly 14,000 ft. in south Kashmir's Anantnag district.